We hear a lot about how video games are to blame for violence, but how about a video game project that highlights violent gun crime in American society? That's what Professor Joseph DeLappe is trying to achieve with his Grand Theft Auto livestream, Elegy. Elegy is a "hacked" version of Grand Theft Auto 5 which you can find on games streaming platform, Twitch. In it, non-playable characters (NPCs) do nothing but shoot each other dead. But there's more to the action on screen than senseless violence. The stream is connected to American gun crime deaths from 2018. Every NPC killed in the stream represents one US citizen who has died this year in a shooting incident. The stream resets at midnight and the carnage begins again, and soon the fictional streets of San Andreas are filled with bullet-ridden corpses - each day with more than the previous. Joseph says this is a way for people to make sense of the official figures. Website Gunviolencearchive.org reports that there were 7,165 gun deaths in America in the first six months of 2018. "When you see those numbers get beyond the thousands, it's very hard to realise what that translates to in actuality," says Joseph, who grew up in the US but moved to Dundee to teach at Abertay University in early 2017. He's a professor of games research and his GTA hack was inspired by his time living in America. "I lived for quite some time in Nevada, it's very much a gun state," he says. "I remember going to a coffee shop to get a latte and walking past a guy at the table and he's got a pistol sticking out of his waistband. It's scary. Joseph says he feels much safer now he lives in Scotland. 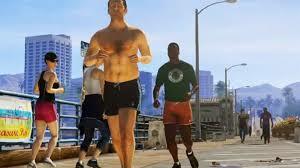 Grand Theft Auto was chosen for how easy it is to modify and also because it has a reputation as an exceptionally violent game. "Elegy is very visceral; it's very disturbing and quite an intense visual experience," says Joseph. He also hopes that this project will flip the "frustrating" belief that video games can cause violence by using that format to highlight those real-life gun crime issues. "It's just a way of ironically using the very systems that people think are contributing to violence and putting something out there that perhaps considers the entire situation from a different angle." Earlier this year, President Donald Trump promised to "do something" to tackle the violence young people see in video games. But many people believe video games can have positive effects on mental health, despite some of their content.